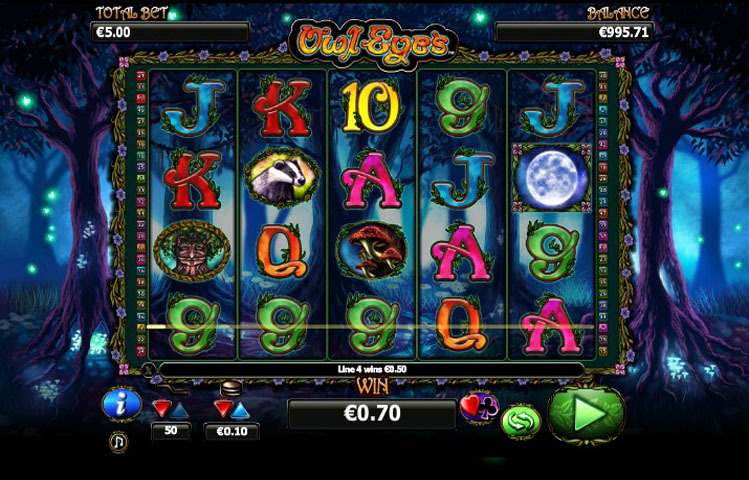 Owl Eyes video slot is produced by NextGen Gaming, a premier betting software company. It has 5 reels with a 50 payline slot. This game is a fun line slots that will attract players and keep their attention. It has a simple design, shrouded in an air of mystery that will fascinate players from the beginning. The main theme of this game is an enchanted forest at night, where almost anything can happen. Players will see symbols such as owls, badgers, and mysterious trees with faces. Along with the brilliant graphics is the audio that mixes in the sound of chirping crickets. It makes players feel like they have stepped into the woods at night. The ethereal music adds to the suspense surround the theme of the game. It starts as soon as players spin the reels. There is a couple of seconds of silence after each spin that adds to the mystery in the slot game. Free spins and stacked wilds are available on Owl Eyes. Players get 5 free spins from bonuses. These can be re-triggered and made even more fun; however, the limit to free spins stays at five. The game offers stacked wilds and free spins, although players have only 5 free spins to look forward to. The free spins can be re-triggered, however, making them just that little bit more exciting, even though players aren’t awarded as many spins as they might like. Playing Owl Eyes is really easy. Players start out by placing their wages and the number of lines they want to play. They can either press the “spin” button to spin the reels, or they can press autoplay to have automatic spinning. There are good betting options on this game. Every win can be wagered by having the players try to predict the color of the card drawn. When they guess correctly, the win will be doubled. If players can guess the suit, their winnings will by multiplied 4X. Winnings can be wagered up to 5 times. The Wild symbol for the game are the Owl Eyes. It can appear on reels 3, 4, and 5 in the base game. It substitutes for all icons except the Moon. The Moon icon is the scatter symbol and it can appear on any of the reels. If players get at least three Moons in a row, they will win 5X the total wager. If they get four Moons in a row, they get 20X the total wager. The lucky player who gets 5 Moons in a row will win 100X the best. Having three or more Moon icons will send players to the bonus round with free spins. Stacked wilds can appear during the bonus and will re-trigger the free spins. Players can bet between 0.01 and 2 when playing this video slots game. Owl Eyes by NextGen gaming will provide hours of entertainment for gamblers placing their wagers on the wheel. The graphics and sound are superb and will take players to a fantastical place where anything seems possible, such as free spins that can be re-triggered. This game will keep players’ interest and may become the favorite game of many.